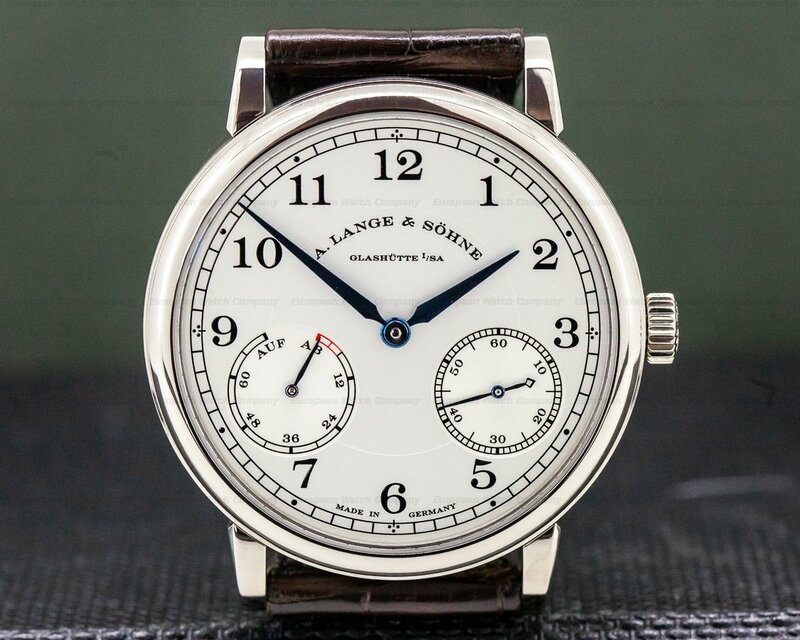 30348 A. Lange & Sohne 192.029 Lange 1 Moonphase 192029, 18k white gold on a strap with an 18k white gold tang buckle, manual wind A. Lange & Sohne calibre L121.3, black dial with applied Roman numberals, large date at 2 o'clock, 72-hour power reserve with indicator at 3 o'clock, small seconds with moonphase and day/night indicator, display back, sapphire crystal, water resistant to 3 atm, diameter: 38.5mm, thickness: 10.4mm, like new with box, setting pin, and original papers; dated 11/2018. 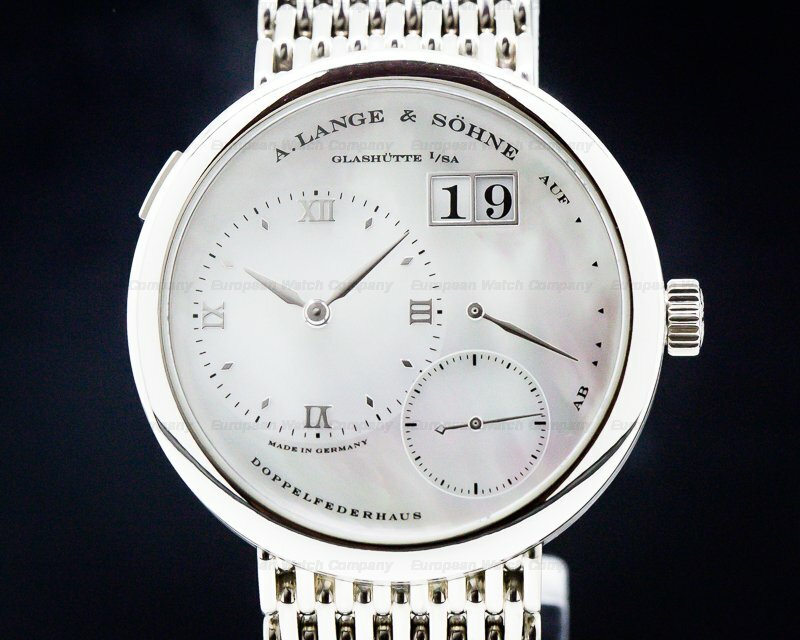 This is an 18K white gold A. Lange & Sohne Lange 1 Moonphase 192.029. 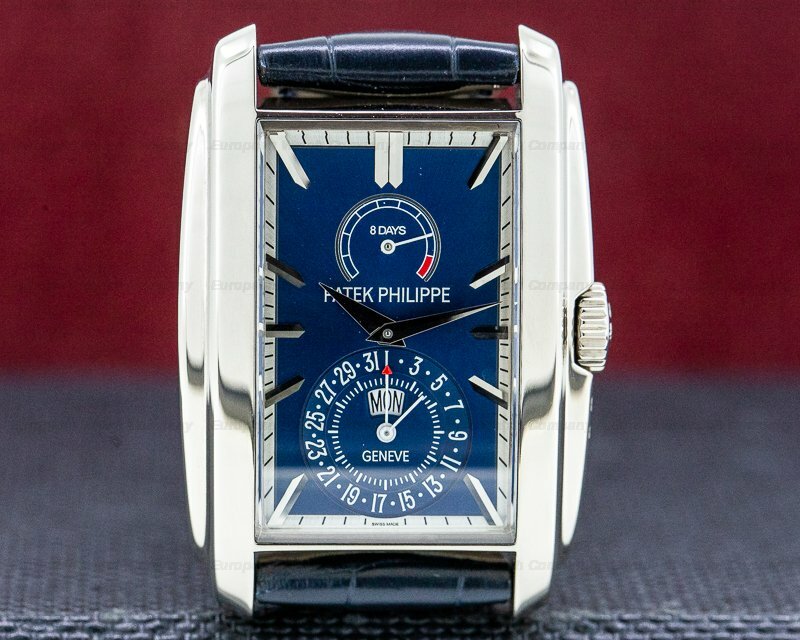 It has an alligator leather strap with an 18k white gold tang buckle, and a scratch resistant sapphire crystal. 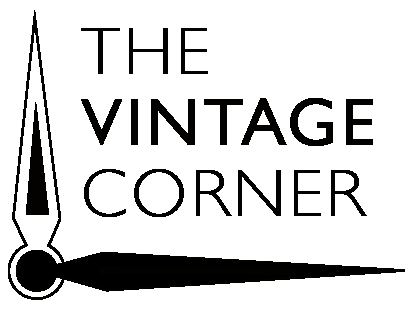 It has a screw down winding crown, a corrector on the left-side case band for the date, and there is a rectangular stop seconds push button at 10 o'clock. 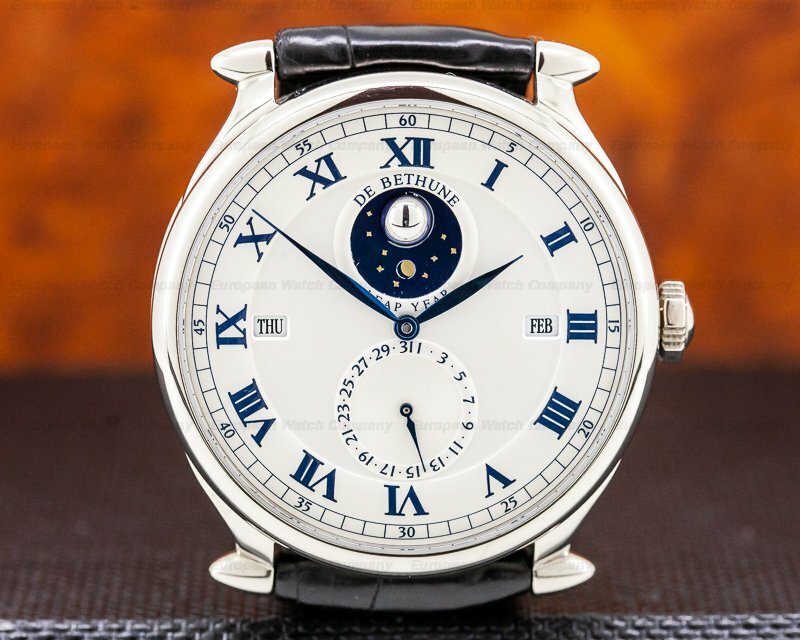 It includes an exhibition sapphire display case back secured with 6 screws, and engraved with "A. LANGE & SOHNE – GLASHUTTE SA," a serial number and hallmarks. 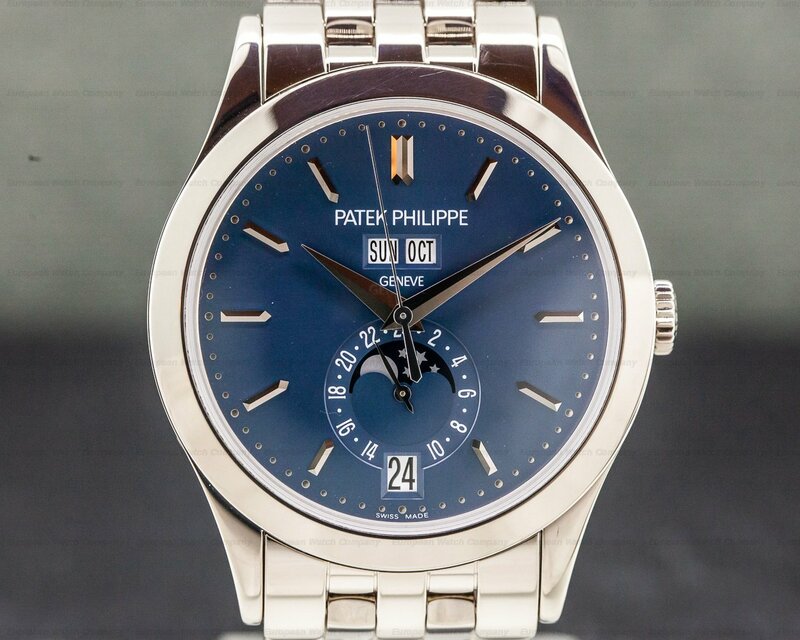 The 38.5mm diameter solid three-body case, curved lugs, and stepped bezel, are polished/brushed. 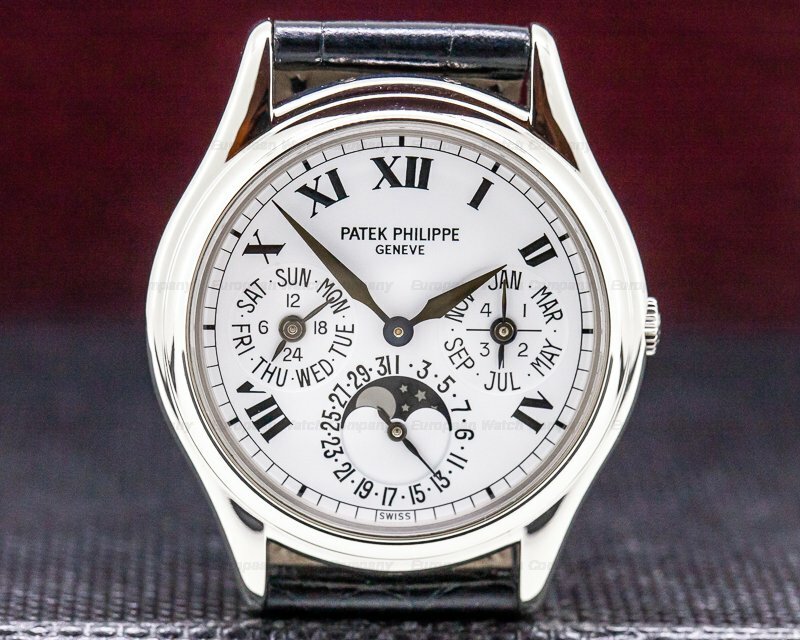 The dial is black with applied white gold Roman numeral hour markers at the quarter hours, sword hands with luminous inserts, and an applied diamond-shaped hour indices around an off-centered time dial with perimeter luminous white minute markers. This and the black moon phase dial at 5 o'clock have fine concentric engine-turned guilloche patterns, and there is a gold-rimmed oversize instantaneous date aperture window at 1 o'clock. The moon phase indicator is comprised of two discs - one that carries the moon, and one behind it that rotates once every 24 hours. The disc carrying the moon has one days' error every 122.6 years. There is an up down power reserve indicator on the perimeter from 1 to 4 o'clock, and it's water resistant to 30 meters/100 feet. 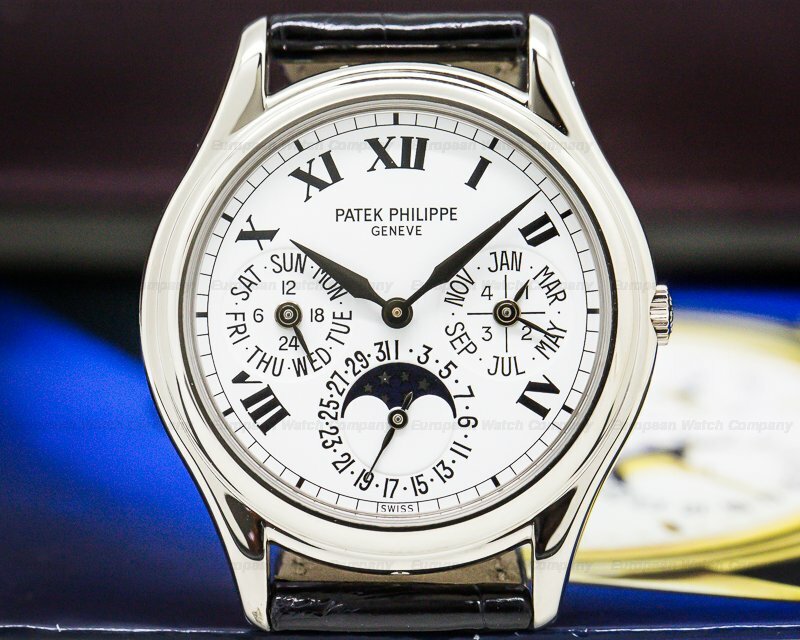 It has a 72-hour power reserve at full winding, and the 10.4mm thick case, dial, and movement are all signed. 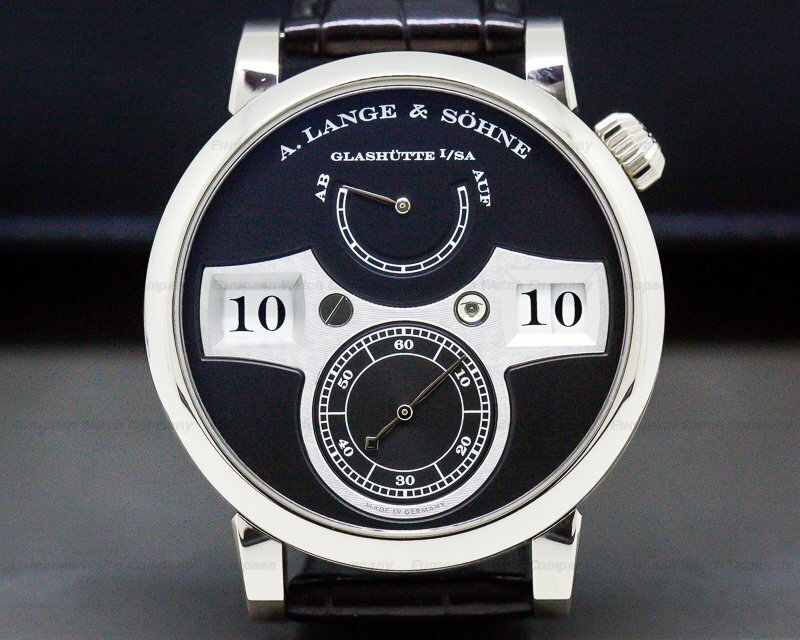 This A. Lange & Sohne Lange 1 Moonphase 192.029 has a mechanical manual winding A.L.S. caliber L 121.3. 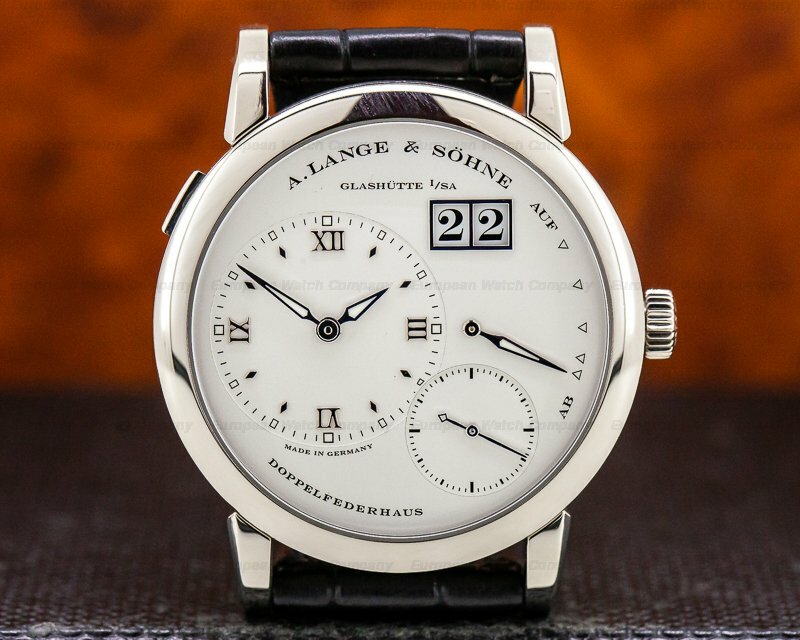 It's rhodium plated ¾ plate with cotes de Geneve embellishment, and it's constructed with a straight-line lever escapement, 43 jewels, eight gold chatons, 368 components, a swan neck regulator, and A. Lange & Sohne’s own free sprung balance made to a chronometric standard. It includes a precision beat adjustment system with a lateral setscrew and a whiplash spring. The mechanism oscillates at a frequency of 21,600 vph (3 Hz). 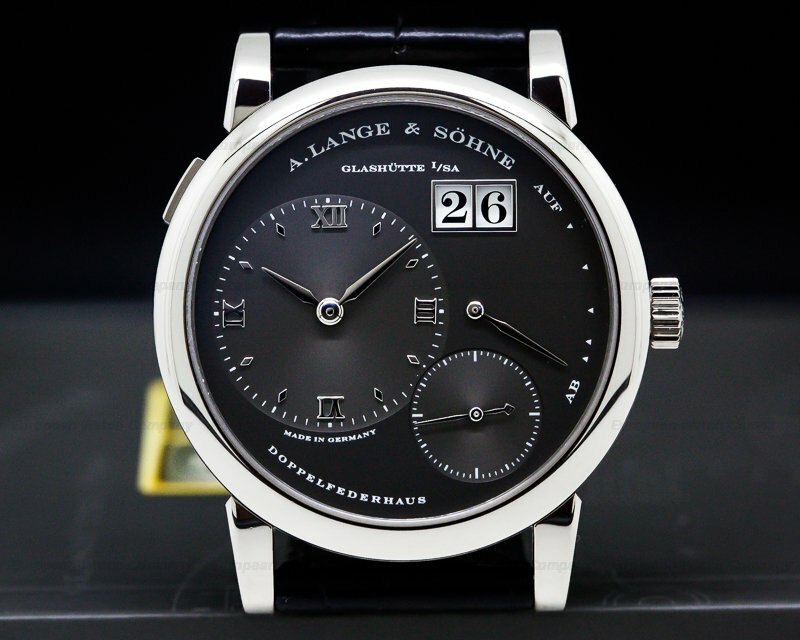 The A. Lange & Sohne Lange 1 Moonphase 192.029 was introduced at the SIHH in 2017.